Comment posted immediately following September 11th attack. As the events of the 11th unfolded I found myself so overwhelmed that for an hour or two I simply pulled out of an important planning meeting in which I was engaged. I needed to sit quietly with my thoughts. 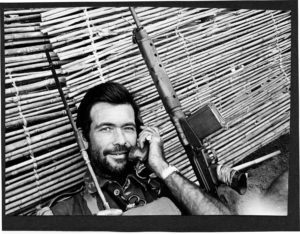 In my youth, growing up in Rhodesia after World War II, I somehow recognized that guerrilla warfare would be the future form of warfare and I began studying, and later fighting for over twenty years in such a war. I mention this past briefly because as this week unfolded, having gone through much of my life in senseless guerrilla warfare, I began to see the past floating before my eyes. What I saw was not the endless showing of the towers being hit and then crumbling, followed by the anguish of family and friends of the dead but something sinister and frightening. I felt an emptiness not because of the tragic loss of life of so many Americans and others, including we think five of my countrymen, but because of the views coming through the television interviews with leaders and public figures. I could not help but notice that all talked of America’s strength and resolve, war and revenge. Not one leader replied in the manner I would have found myself responding in my anger and grief. The President has called it a new form of war and named it the First War of the 21st Century. He has pledged to win it at a time and place of our choosing. Although this pledge is understandable in terms of prevailing emotions, it is about as meaningful in real terms as the many pledges to win the war against drugs. America and the Western nations, whose way of life is under attack, will need far deeper understanding for peace and what we all value in our way of life to be safeguarded. This is not a new form of warfare – it is one of the oldest forms of warfare. Today, due to technological advances, it is capable of wreaking unbelievable damage. Nothing I write should be construed as not having feelings for the dead and suffering – I only risk writing at such a sensitive time because my feelings run deep, and after living so much of my life with violence I want desperately to see an end to such suffering. America will be called upon for international leadership in this hour of need. Is America up to that responsibility and what does such leadership entail? Let me make a few basic points. First, people waging guerrilla warfare try to undermine their enemy by actions designed to cause a spread of terror, over-reaction, economic damage, etc. Commonly they hit soft (not military) targets that will inflame emotions simply because they do not have the military strength to do otherwise. If skillful they strike in such a manner that their more powerful opponent will fan the flames and spread terror, lack of confidence in the economy, etc., and do the job for them. A mistake made by most governments is to call their opponents ‘terrorists’. The constant use of the word ‘terrorist’ while televising dramatically the damage and suffering makes their action several million times more damaging. If you want to spread terror use the word terrorist repeatedly, associated with terrifying pictures, and low and behold you do spread terror. I watched Ian Smith do this repeatedly in Rhodesia’s long struggle for independence. Long ago in that struggle I said publicly that if I were a guerrilla I would pray that my opponents would call me a terrorist to further my aims. The Smith government made that mistake and repeatedly attacked me as an army officer and Member of Parliament for using the name guerrillas instead of making any attempt to understand the form of warfare they faced. Smith, his generals and media gurus, through ignorance about guerrilla warfare guaranteed their own political defeat. In saying all this, I am not indulging in hindsight as many times on the public platform I said that Mugabe’s (then leader of the black guerrilla forces and now the President of Zimbabwe) greatest allies were Ian Smith and his generals who, while waging a ‘war against terrorists’, were winning political victory for Mugabe and ensuring the end of democracy for years to come. Second, I see in America floating before my eyes once again something I lived through. Our strength is our greatest weakness. What do I mean by this? In Rhodesia we had an extremely capable and efficient army for bush warfare. We knew it and were intensely proud of our army. We never lost a single encounter or battle no matter what the odds, but that, as I pointed out many times during the conflict, guaranteed we would lose the ‘war’. I say this simply because these situations are not ‘wars’ requiring military solution, but situations requiring civilian policies that deal with the root cause of people’s frustrations and suffering. Because we white Rhodesians were so strong our government, under a political leader rather than a statesman, was unwilling to even contemplate seeking the necessary solution that would preserve the democracy we valued. That, after all, would appear ‘weak’ to the bulk of the electorate who wanted tough-talking generals and politicians. When, as leader of the opposition in Parliament, I said (to Smith) “You are going to have to talk to the guerrilla leaders” I was branded a coward and traitor in public. When I said on one occasion “If you want to win this ‘war,’ you need to understand your opponents and to understand why someone like me would say “If I had been born a black Rhodesian, instead of a white Rhodesian, I would be your greatest terrorist” I lost the support of even my own party and ended up in exile. I use the similarities with Rhodesia because only the scale differs. America’s leaders would be wise not to treat this as a ‘war’ but rather as a serious wakeup call to look at an extremely broad and comprehensive strategy involving our foreign and domestic policies as well as our education and business systems. Right now there is a need to motivate people to unite. And there is a need, which the President and his advisors are tackling well, to collaborate with other nations and go after the perpetrators determined to bring them to justice. However, this should be done without setting our people up for war and retaliation. There is a need, while unity and determination still hold, to initiate the moves to bring about a civilian strategy to win the peace we all seek. If we rely solely on our military strength in retaliating, far from ending the war “in a place and time of our choosing,” we will bring about counter retaliation at some time. This has been the most massive guerrilla attack ever staged, but it will pale into insignificance with future nuclear or biological attacks unless our leaders act with understanding and wisdom as well as determination. There have always been evil people, and there will continue to be such people. We need of course to share intelligence between nations and root them out. But at the same time we need also to address the causes to which they attach themselves and to dry up their source of recruits. I am sorry that many in this nation are focused only on America and seeing this as an attack on this nation and on democracy. It is not a war in which ‘they’ are trying to conquer America or defeat democracy. Public memory can be short. It was but months ago that thousands of peace-loving people (including prominent Americans) brought the World Trade Organization Conference in Seattle to a halt. Now, this strike at the World Trade Center as the principal target by ruthless people exploiting grievances for their own ends should have conveyed a message to all developed nations – America, Britain, France, Germany, Japan and others. If America is to provide the leadership the world is crying out for, we would be wise to try to understand how and why the Bin Ladens of the world can have such a pool of angry young people to call on who are prepared to give their lives so readily. We need to understand and heed the cries of people displaced by massive dam construction in India or Africa, or the bulk of the Mexican population who deplore the loss of their way of life and all they value most dearly as we pursue policies like NAFTA. We need to understand that we cannot call on people in poor countries to be good capitalists and then go to war against them for supplying our people with the drugs our citizens seek at any cost. We need to understand that when we ban chemicals because they are known to be damaging to humans that we should not allow multi-national corporations to increase their manufacture and sale to third world countries so we can profit. We need to understand that we cannot take thousands of years of careful nurturing of genetic material by simple people and patent the genes for the profits of our corporations and their shareholders. We need to understand that in many ways it is not democracy that is under attack but rather certain aspects of our lives that others see as causing their poverty and suffering. I know many Americans, including good friends of of mine, will immediately say, “but our policies are not harming them.” I am afraid that, even if we could honestly say that NOTHING we (our government or our multinational corporations) are doing is resulting in environmental destruction, oppression or exploitation, in situations such as these, if others even perceive our policies as harmful to their culture and way of life, that becomes the political reality. It is essential, in our own enlightened self-interest, that we look at our policies and business activity and the effect these are having on the world’s natural resources and individuals and communities. I am not a politician. I only went into politics in my country as a junior army officer with a deep knowledge of guerrilla warfare to try to end a senseless war of self-destruction. But over the twenty years that I have been a ‘political has-been’ I have never ceased to try to think of ways nations might end such violence. And I have never ceased to work on the causes underlying most worldwide violence – decision making and policies that are made without consideration of the long-term social and environmental consequences. I don’t know who originally said it, but I have long believed that “Until all people feel secure and well governed, none are”. No nation can be an island unto itself in the modern world. In America we may feel secure and well governed but are we? Clearly by this definition we are not. When the towers were first hit and blame started to fly, more than one person raised the question – are we sure this time that it is not Americans? Looking at our current government, it is clear that many Americans are not represented at all in our “representative” democracy. We don’t even have a Parliamentary opposition in the sense that I understand of that concept. What we have is a government formed from alternatively one or the other of two wings – left and right – of the same corporate party, managed by a mature and often insensitive bureaucracy. As a consequence, millions of Americans are politically emasculated and apathetic, feeling a deep sense of hopelessness. The present catastrophe will unite all Americans as never before and that is good. But the unity will not last. If our leaders cannot see what is happening in our own country, what hope have we of understanding the frustrations of millions who are daily affected by the policies of the US, and our fellow Western powers that support corporations with economies and powers greater than whole nations. The focus will be on America as the single super power, but Britain, France, Germany and other countries are as much part of what many millions of people see as the ugly (environmentally and socially devastating) side of capitalism. The focus is on the US because we are seen as having a small percentage of the world’s population consuming a very high percentage of the world’s resources resulting in vast impoverishment for others. And, we are known to engage in foreign policies that prop up despots (including those who, with our knowledge, enrich themselves on our aid), in the name of ensuring our oil supply or military bases. It cannot be repeated too often – poor land leads to poverty, disease, social breakdown, abuse of women, increasing violence and genocide – and ultimately war. One has only to look at the many resource management policies of the US, or the World Bank and other governments and organizations heavily influenced or dominated by American money and our educated and consumptive elite, to see that we are guaranteeing an increasingly violent future for our children and for our allies and their children. As I write, the President is sitting with his National Security advisors to decide how to respond. They are intelligent people who will advise on all aspects of security within the comprehension of their professions – military, economic, political analyst or whatever. Probably the President could not put together a more competent team if we were at war. However, I would wager a bet that this same team will be ill-suited to forming a strategy to win the peace. Building our response on a war analogy is dangerous in the extreme. While the President will politically have to respond with force in some form right now, it would be wise to look and work beyond these actions, and to begin addressing the root cause of this attack immediately. I believe to win the peace the National Security advisors should be expanded to include men and women who understand the effects on millions of ordinary peace-loving people of such things as our agricultural policies and NAFTA as well as the actions of not only US-based but also multi-national corporations. Conventional economists have almost no comprehension of the effects of, for instance, agricultural policies on rural American families let alone families in India, Pakistan, Mexico and Africa.  I would recognize the need for statesmanship rather than gut-level politics.  I would do all in my power, working with our allies, to bring the perpetrators of the current violent actions to face international justice.  I would not call it a war but rather focus on this as a struggle for worldwide peace involving our leadership of all nations.  I would treat it with the utmost urgency, as this horrifying act has been a bigger blow than was the strike at Pearl Harbor.  I would recognize that failure of the developed nations to address worldwide biodiversity loss (failing natural resources), global climate change and social injustices will result in ever more horrifying events involving nuclear and biological weapons.  I would put the situation on a ‘war footing’ in terms of seriousness and allocation of funds and people – no price is too high to pay and, as in war, I would go beyond using only establishment bureaucrats and experts.  I would task an expanded “advisory group” with developing a comprehensive civilian and military strategy and monitoring system to address over time the root cause of most worldwide violence – decision making that is environmentally and socially unsound.  I would, as my duty to the nation, insist that this expanded “advisory group” have free reign to investigate all aspects of our political, economic, educational, trade and business systems – there would be no sacred cows.  To the expanded “advisory group” I would appoint people who have a track record of understanding the underlying problems, social and economic ramifications of destructive agricultural and land management policies, trade policies, and more that lead to poverty, frustration, displacement, disease and violence (there are many such people in America and Europe consistently ignored at present). And I would include people with a sound knowledge of guerrilla warfare as well as conventional warfare.  I would urge all politicians to accept the recommendations of such a strategic group in a non-partisan manner so that implementation could proceed rapidly in the interests of all nations. In short, I believe the surest way to guarantee Americans a future of severely restricted liberties and fear of violence is to treat this as a war that can be won with economic and military might. The war analogy focuses on what the enemy is doing when we need to focus on what we are doing to ourselves. The possibility of even more horrific acts is increased when rogue religious groups such as the Taliban (most Muslims, as well as the Koran, preach peace and harmony), and individuals like Bin Laden, can recruit people willing to commit suicide and align themselves with genuine grievances for their own ends. To let such evil people put up a smokescreen that clouds our vision and draws our attention away from addressing the real grievances of millions of peace-loving people would be the greatest tragedy, and it would play into the hands of future Bin Ladens. This is a battle for peace that can only be won by statesmanship that ensures the people that we will take steps to contain the present violence to the best of our ability while we at the same time start to address the things needed to ensure that all people feel secure and well governed.